With deep sadness we announce, that on 4 brand 2016 year on eternal guard left our colleague Col. st. buried. dr inż. 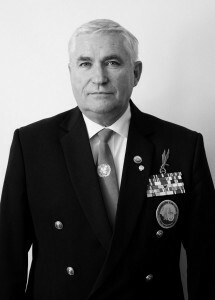 Tomasz Jerzy Limanowski president of the Circle No. 47 National Defence Academy. Lived 66 year. Most of the activity involved with service roles within the different units of the Polish Army in the extent of the serial Colonel. He was awarded many state awards and departmental. Graduate School of Mechanized Forces Military Wroclaw - promotion 1971 year. Between 1971-79 he served in various positions in the Joint Staff Command and reconnaissance units of the Warsaw Military District. In 1981 he graduated from the Academy of General Staff, which then she began to work teaching and research. In 1989 he was awarded the degree of doctor of military science in the field of military art, specialty tactics. He directed the Department of Peacekeeping Operations at the Department of the Army ASG. 31 August 2002 year – when 35 ended years of professional military service. Between 2011-2013 - Assistant Professor in the Department of National Security and the National Defence Academy of 1 July 2013 year - adjunct-director of the Department of Foundations of Security Institute of the State Security NPV. 2002 – OSCE mission Macedonia. social-worker, an active member of the Association of Veterans of UN Peacekeeping Missions, Member of the Board, President of Circle No. 47 National Defence Academy. We bid farewell with deep regret and sadness officer, friend and colleague, which was characterized by selfless and spontaneous desire to help anyone, who need it. In honor of his memory!